Are you a Kirtan lover ? A yogi/yogini ? or someone who wants to deepen your spititual practice? Do you want to learn authentic and traditional Kirtans? Do you want to know how Kirtans are related to Indian Ragas? This eBook explains about Kirtans and Indian Ragas and how certain Ragas can be used to sing certain Kirtans or chants for a deeper meditation. 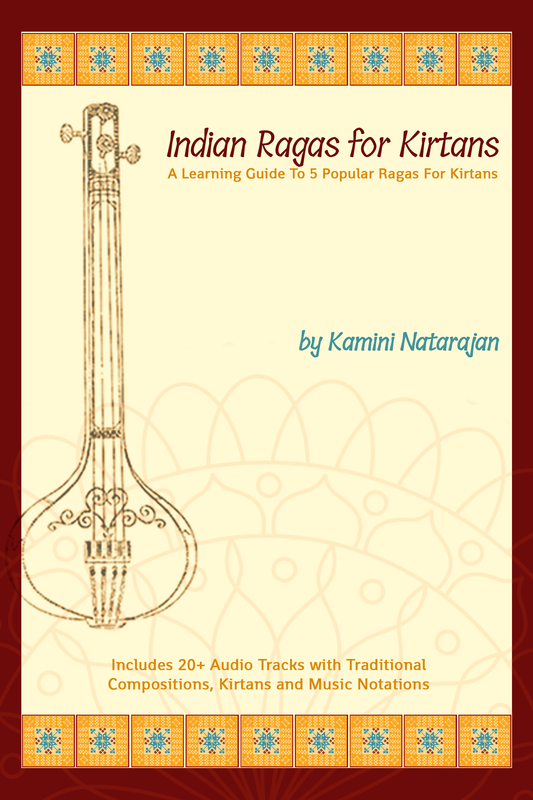 This ebook will introduce you to 5 ancient Ragas that are used for Kirtans. These Ragas have been scientifically proven to help meditate, reduce anxiety, help with depression and blood pressure levels. These are extensively used as a part of music therapy. This ebook has 3 sections. Section 1 includes theory about Indian Classical music- terms used and explains Indian music performance. Section 2 is about various Taala (rhythm) cycles used in Indian music. Section 3 contains 5 ragas, their descriptions, compositions and notations. There are two main Classical music systems in India. Hindustani or North Indian Classical Music and Carnatic or South Indian Classical Music. This ebook is about Hindustani / North Indian Classical Music system. Terminology used in Indian Classical Music such as Raga, Thaat, Aaroh, Avroh, Vaadi, Samvaadi, Jaati, Pakad, Anuvaadi, Vivaadi, Sampoorna, Shadaav, Audav etc: meaning of these terms, translations and/or brief explanations. 5 Ragas: Yaman, Bhairav, Bilaawal, Khamaj and Bhairavi. Aaroh (ascent), Avroh (descent), Pakad (Key phrase or motif), Vaadi (Sonant or dominant note), Samvaadi (consonant), Time, Mood/emotion, Jaati (number of notes) and brief description of all these 5 Ragas and their MP3 Tracks. Western notations and MP3s of one traditional composition in each raga called “Sargam” (melodic outline) which has no lyrics, only notes. Kirtans in all these 5 Ragas with western notations and MP3 tracks so that you can listen and practice. This ebook contains images of notations. You can download higher quality PDFs of these notations as a zip file. After completing this ebook you should have an understanding of Indian Classical music commonly used terms, 5 Ragas, how they are sung, how you can improvise and how you can sing your own chants in these Ragas.